So who out there is really surprised that Pitt lost to Bowling Green despite them being ranked in the Top 25 by practically every reputable ranking site? Remember, this was supposed to be the year Dave Wannstedt gets Pitt to finally live up to their potential and break through to a big bowl game. Hmmm, maybe everyone forgot something very important. Dave Wannstedt is coaching them. Speaking of which, every college football site out there is talking about how bad the ACC is. "The worst conference," "a college basketball conference," etc. Pardon, but did anyone check out the Big East? Remember that conference? Pitt loses in embarrassing fashion to Bowling Green. Lousiville gets its doors blown off by SEC superpower, Kentucky. And media darling Rutgers loses to Fresno State. Three of the league's powerhouses lose...at home...to inferior opponents. Why all the hatred for the ACC and none for the Big East? The NFL Network is reporting the Kansas City Chiefs and Oakland Raiders have expressed an interest in Koren Robinson. Ummm.....why? Jon Stewart is going to be the best running back out of this draft. Better than McFadden. Better than Forte. The best. Look out for this guy, he's a monster. Pro Football Weekly is reporting that New Orleans Saints insiders are starting to feel that Reggie Bush will never be what they were hoping for when they drafted him second in the draft. Despite staying in New Orleans this past summer to be near teammates and work on speed and strength, there is little evidence on the field that suggests he has taken a huge leap forward and become the everydown back they hoped for. Let me just say this: In two years you are going to see a lot of a very unhappy Shawn Merriman. Here's why. Even though four different specialists recommended that Merriman have season-ending surgery to repair two torn ligaments in his left knee — both the posterior cruciate and lateral collateral ligaments — the Pro Bowler has opted to forgo the procedure and play in 2008, despite the high likelihood of worsening the ligament damage. And the Chargers are fully behind Merriman in this decision. That's because the team wants to get all it can out of the linebacker during the next two seasons, as Merriman’s contract is up after ’09. After 2009, the Chargers almost certainly won’t shell out the funds to re-sign him. And when he doesn't get paid after sucking it up and playing hurt, Merriman is gonna be pissssssssed. I think the fact that the Jets are keeping 4 QBs on the roster is a testament to the fact that they don't want to cut a QB they spent a no 2 draft pick on. But there's no doubt, the new darling in the coaches eyes—behind Brett Farve, is Brett Ratliff, who had a stellar pre-season. 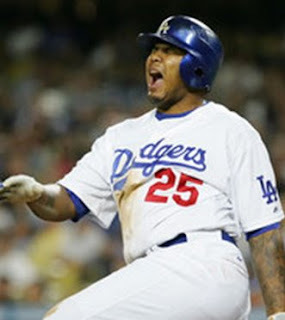 And lastly, just wanted to remind everyone: Andruw Jones is batting .161. That number again is .161. The other number you need to know is 18.1 million. That's his salary for hitting .161. Geez with those numbers, Mythbusters should do a special on him to find out if there really ever was a ballplayer named Andruw Jones. Just amuse myself I wanted to see which coach has gotten more head coaching gigs from their tenure as a coordinator with Cowboys in the 90s: Norv Turner Or Dave Wannstedt. 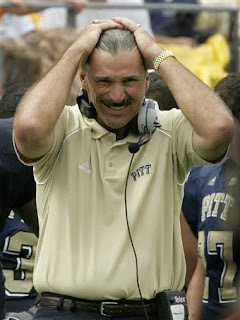 Wannstedt: If you include getting the head coaching job at Pitt (and I do) he is entering his 15th season of mediocrity. Tuner: Is in his 11th season and he has racked up a stellar 69-88 including yesterdays game.